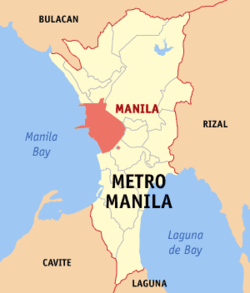 Manila (Tagalog: Maynila; pronounced /maɪˈnilaʔ/ in Tagalog, /məˈnɪlə/ mə-NIL-ə in Inglis), offeecially the Ceety o Manila, is the caipital o the Philippines an ane o the saxteen ceeties athin the Manila metropolitan aurie, ane o the maist populous metropolitan auries in the warld wi a population o 20 million fowk. It is locatit on the eastren shores o Manila Bay on the wastren side o the island o Luzon. Several ceeties lee on its border: Navotas an Caloocan tae the north, Quezon Ceety tae the northeast, San Juan an Mandaluyong tae the east, Makati tae the sootheast, an Pasay tae the sooth. Manila haes a nummer o sister ceeties warldwide, as classifee'd bi the ceety govrenment. Each sister ceety is dividit intae three pairts, namely the International, Friendly location an Local Ceety. Manila haes 33 Internaitional Sister Ceeties, three Friendly Location Ceeties an twa Local Sister Ceeties. ↑ Brinkhoff, TH. "The Principal Agglomerations of the World". CityPopulation. Retrieved June 15, 2010. ↑ "World: metropolitan areas". World Gazetteer. Archived frae the oreeginal on 2013-01-05. Retrieved June 15, 2010. ↑ 5.00 5.01 5.02 5.03 5.04 5.05 5.06 5.07 5.08 5.09 5.10 5.11 5.12 5.13 "Sister Cities of Manila". City Government of Manila. Retrieved 2009-07-02. ↑ Allison Lopez (August 7, 2008). "Manila mayor flies to 'sister city' for Beijing Olympics". Philippine Daily Inquirer. Retrieved 2008-09-09. ↑ "Guangzhou Sister Cities[via WaybackMachine.com]". Guangzhou Foreign Affairs Office. Archived frae the oreeginal on 24 October 2012. Retrieved 2013-07-21. ↑ "The 45 Sister Cities of taipei". taipei.gov. Retrieved 2008-09-09. ↑ "Sister Cities". New Winnipeg. Archived frae the oreeginal on 2005-12-28. Retrieved 2008-09-09. ↑ "Eight Cities/Six Ports: Yokohama's Sister Cities/Sister Ports". Yokohama Convention & Visitiors Bureau. Archived frae the oreeginal on 2009-05-05. Retrieved 2009-07-18. Wikimedia Commons haes media relatit tae Manila. This page wis last eeditit on 27 Julie 2018, at 06:16.